The Wasp model is based on dividing the solids in two fractions. The fraction in suspension, named the vehicle, and the fraction behaving according to the Durand & Condolios equation. The fraction in suspension is based on the concentration distribution in the pipe, the ratio of the concentration at 92% of the pipe diameter to the concentration at 50% of the diameter. The concentration distribution is determined with the advection diffusion equation for open channel flow. Modifications of the Wasp model are based on different formulations of the diffusivity in the advection diffusion equation. 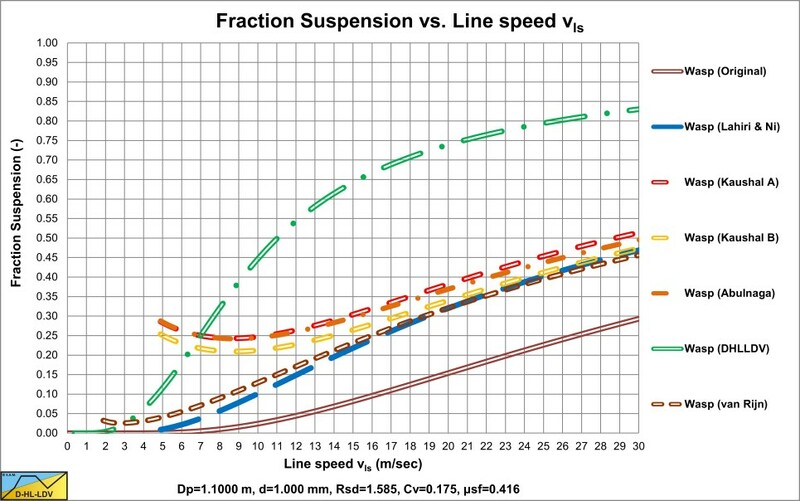 The higher the line speed, the larger the fraction in suspension. Here the cross sectional averaged hindered settling velocity is used for the concentration distribution. For pipe diameters close to Dp=0.1524 m (6 inch) and small particles, the Wasp model gives good results. For large particles the Wasp model is as good as the Durand & Condolios model. 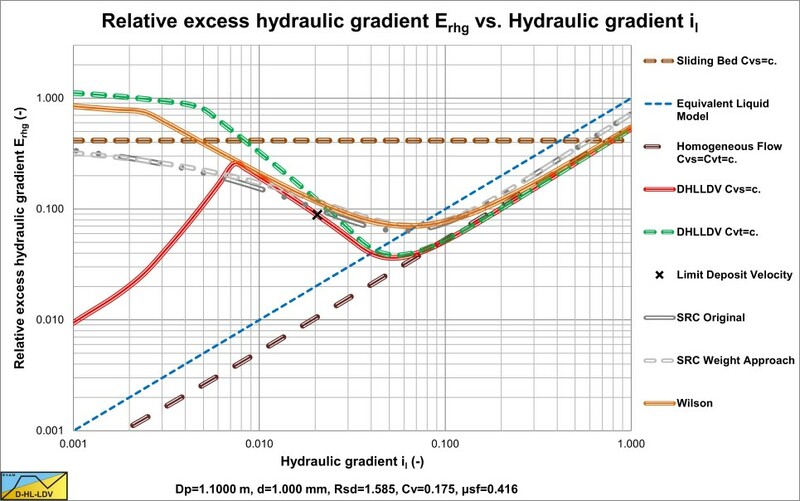 Here the Wasp models are compared with the DHLLDV Framework for a uniform and a graded sand with d50=1 mm. 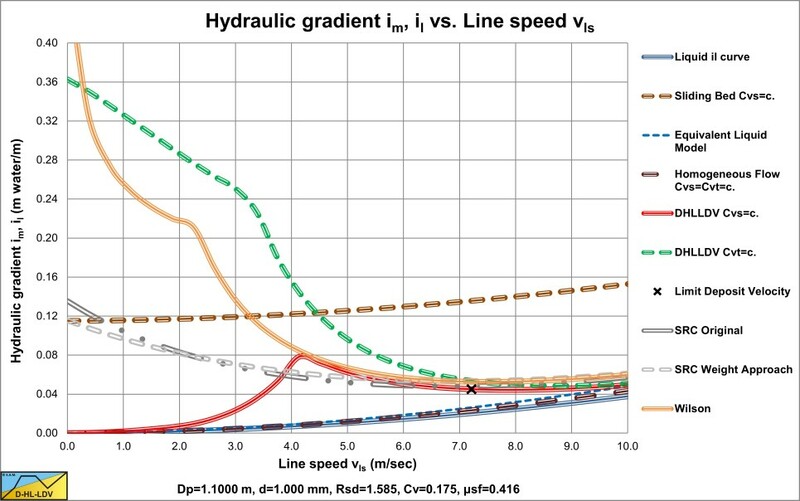 The Wilson model for heterogeneous transport is based on a line speed where the Erhg equals half the sliding friction coefficient, the v50. Wilson named the Erhg the Stratification Ratio. Erhg/μsf would be a better definition for the Stratification Ratio since it equals 1 at the intersection of the sliding bed regime and the heterogeneous regime and it goes to zero for high line speeds. The name Stratification Ratio only makes sense if there is stratification, so in the heterogeneous flow regime. The point defined by the v50 and μsf/2 is shown by the yellow circle. In the Erhg-il graph, the Wilson models show straight lines with a certain steepness. 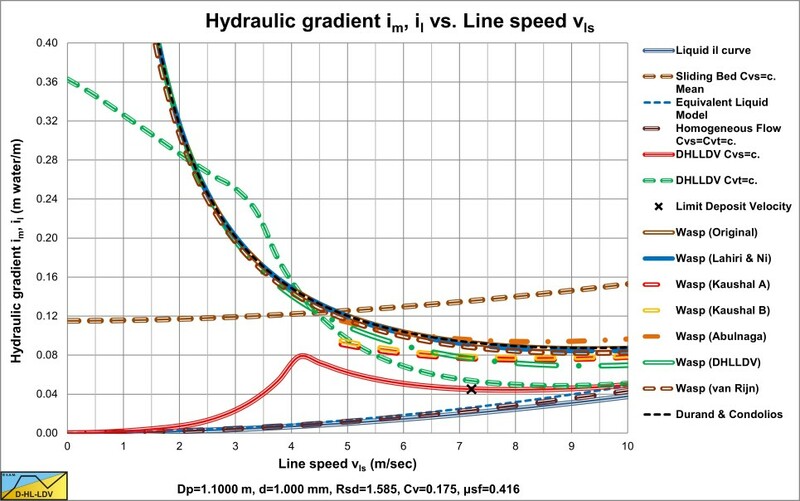 For uniform sands and gravels the proportionality with the line speed is vls-1.7. For medium graded sands this is vls-1.0. For broad graded sands this is vls-0.25. The graph shows that the v50 point is the pivot point for all Wilson curves. 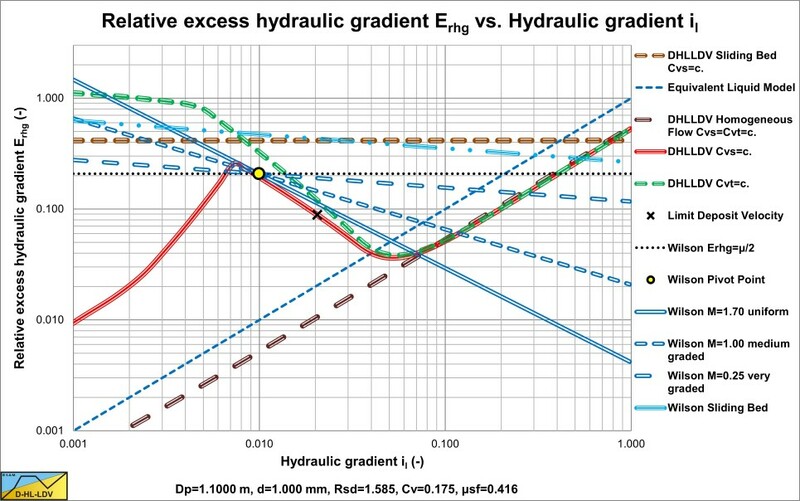 Here the Wilson models are compared with the DHLLDV Framework for a uniform and a graded sand with d50=1 mm. The SRC model is also based on a fraction of the solids in suspension, but now the remaining fraction is in a sliding bed. 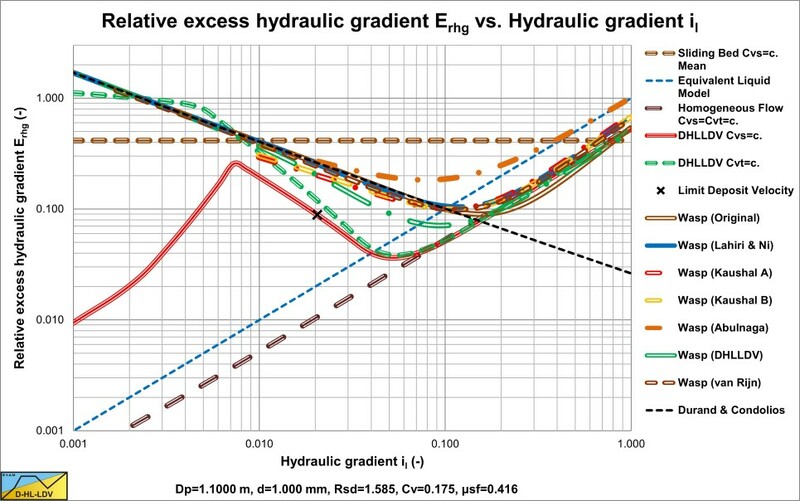 After adjusting the carrier liquid properties based on the solids in suspension and adjusting the relative submerged density based on the adjusted carrier liquid properties, the hydraulic gradient can be determined as a sum of the adjusted carrier liquid resistance and the adjusted sliding bed resistance. The fraction in suspension is determined with an exponential power, similar to the Wasp model. In the comparison the stratification ratio divided by μsf ( with a maximum of 1) is used for the fraction of solids in the bed in order to combine the Wilson heterogeneous model with the DHLLDV adjusted ELM. Here the SRC & Wilson models are compared with the DHLLDV Framework for a uniform and a graded sand with d50=1 mm.